A Champagne brunch for Mother’s Day sounds wonderful — at first. But the reality is we don’t want to have to do anything on our day off, and that includes standing in front of the closet trying to decide on something to wear. For us, Mother’s Day is all about not doing things. It’s about not making the bed, not doing the laundry. Heck, we’re not even making the coffee. This is our day to let others do the doing. So, as is tradition, the kids will be making us breakfast in bed. And to make sure this happens as smoothly as possible, we’ve come up with an easy recipe most kids can tackle with little help: toasted coconut scones studded with dried tropical fruit. Scones are simple to make, which might seem surprising since there are so many bad ones out there. They can range from dense, leaden and dry, or weirdly puffy like cake. But a good scone, one that offers a rich, tender, crumbly, melt-in-your mouth texture, is a thing of beauty, and paired with a big steaming cup of coffee or tea, it’s downright bliss. Scones are a lot like biscuits, both in the ratio of butter to flour, and in the way the butter is incorporated. It’s important that the butter is cold and cut in quickly with a pastry cutter or food processor. That way the scone can achieve a biscuit-like flaky texture rather than a dense cakey crumb. The biggest difference — in my non-British kitchen at least — is that scones have ample sugar (some people add egg, too, but I don’t like how it adds “chew”). And since sugar retains moisture, you don’t need to add as much liquid to scones. Unbaked scones freeze fantastically well. Once you’ve made the dough and cut it into wedges, freeze them on cookie sheet until hard, then pack into ziptop freezer bags. To bake from frozen, reduce the oven temp to 375 and extend the cooking time by about 10 minutes, so they’ll cook through but not get too dark in the process. Kids in elementary school and above can certainly make these from scratch on Mother’s Day, with varying degrees of help depending on how much previous baking experience they have. Basically, if they’ve made cookies they can make these. But if you have really little ones, you might want to make the dough in advance so they can simply shape and bake the scones the morning of and still feel like they “made” you breakfast. And if you’re visiting a special mom on Sunday, do her a favor by swapping out the usual flowers for a basket of these and a jar of lemon curd. Homemade treats are a much more personal gift. But no matter what you do, don’t just save these for one day a year. These rich, fragrant, tender scones are well worth putting in your breakfast rotation. I avoid using sweetened shredded coconut whenever possible because they’re soaked in a preservative that makes them smell and taste like chemicals. Instead I use unsweetened shredded coconut, which can be found in the bulk bins at stores like Whole Foods. 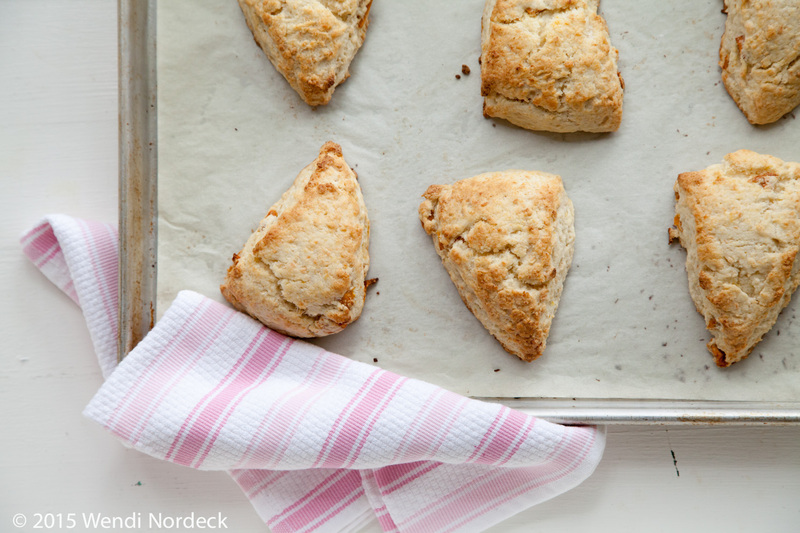 Unbaked scones freeze beautifully so don’t be afraid to store a few in the freezer. To bake from frozen decrease heat to 375 and bake about 10 minutes longer. This recipe was written to be simple enough for kids to follow. To make the scones: Preheat oven to 350 degrees. Spread the shredded coconut on a rimmed baking sheet and toast in the oven for about 10 minutes or until most of the shreds are golden brown, opening the oven and stirring them around every few minutes to encourage even browning. Remove from oven and allow to cool completely. Increase the oven’s heat to 425 degrees. In the bowl of a food processor or large mixing bowl, add the flour, sugar, salt, baking powder, and cooled toasted coconut. If using a food processor, hit the pulse button a few times, or mix with mixing spoon until combined. Add the butter and pulse until the butter pieces are no bigger than the size of a pea (about 16 1-second pulses). If mixing by hand, toss the butter pieces with the flour and use a pastry cutter to smash the butter into the flour until the pieces are no bigger than small peas. Add the dried fruit and then the cream. Pulse a few times or mix with a spoon, just until the mixture is combined. Don’t mix too much or the scones won’t be tender. Scrape the dough out onto a clean, dry surface. Gather and press the dough together to form a big ball. Pat the dough into an 8-inch square that’s about 1 1/4 inches thick. With a large sharp knife, cut it in half from top to bottom and then side to side, to make 4 smaller squares. Cut each square in half diagonally to make 8 triangles. You can cut each triangle in half to make 16 small scones if you like. Line a rimmed baking sheet with parchment paper. Arrange the scones on the sheet, evenly spaced apart. If you’re not planning on topping them with glaze, sprinkle each with a little sugar. Place the baking sheet on the center rack of the oven and bake until the tops are golden brown, 12 to 15 minutes. To make the glaze: In a small bowl combine powdered sugar, coconut cream, vanilla and a pinch of salt. Stir until smooth. Drizzle or spoon over the cooled scones. Serve scones with lemon curd, jam or clotted cream. Note: Unsweetened coconut cream can be found at Trader Joe’s and stores with a robust selection of Asian ingredients. It’s much thicker than coconut milk, and makes these scones incredibly rich and tender. The cream will have likely solidified in the can. Just transfer it to a bowl and briefly melt it in the microwave at 50% power (or warm it in a pan on the stove) just until it’s liquid again. Be sure it has cooled to room temperature before using. If you can’t find a can of unsweetened coconut cream you can scrape the cream off the top of canned coconut milk, adding enough of the coconut milk to measure 3/4 cup. The result just won’t be quite as decadent.